It’s nearing the end of summer up here and this means the end of Midwestern grilling season. The lower part of the country probably gets to hang on to the warm weather for a while, but in Wisconsin, we’ll be packing up the sunscreen and lawn chairs pretty quickly. We’re guessing that you’ve probably seen images of hardened tailgating Northwoods Packer fans. We hunker down in our green and gold, tending our grills in the drifting snow, wearing aprons and stocking caps at the same time. Understand that when we say “the end of grilling season”, what we mean is that we can no longer wear shorts while we cook out of doors, but we won’t let it stop us from preparing Wisconsin specialties on our grills on any day of the year. 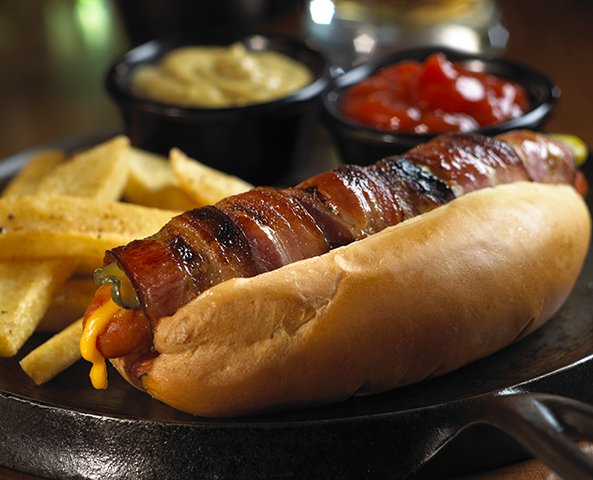 Here’s the first thing we’re tossing on the pre-game grill this fall: our Applewood Smoked Bacon Cheddar Brats. We use rich, smoky bits of our Applewood Smoked Bacon, blended with Wisconsin Cheddar Cheese, to create these extraordinary smoked natural casing bratwurst. The casings have a pleasant little snap to them but these plump links yield to the first big bite, bursting with cheddar cheese and savory-sweet smoke. The next thing that goes on the grill is our classic Applewod Smoked Hot Dogs, and if you want to really impress people, you can try Tanya Nueske’s recipe for “Wittenberg Splits”, the Nueske family’s recipe for bacon-wrapped, cheese-and-pickle-stuffed wieners. Our smoky hot dogs are so good that in a recent review of New Orleans’ best BURGERS, our hot dogs were mentioned! Nueske’s Natural Casing Applewood Smoked Wieners, wrapped (of course) with our Applewood Smoked Bacon. So, summer may be almost out the door, but we aren’t giving up the grill! We’ll have some simple and delicious autumn pork chop recipes for you, next month, for cooking on the grill or stove top, so come back for more in September!